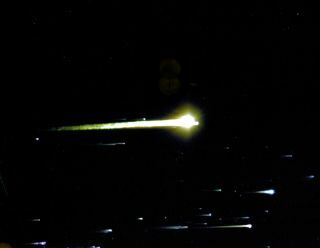 This image captured Apollo 8 upon reentry into Earth's atmosphere. In this historic photo from the U.S. space agency, a reentry photograph of Apollo 8 which was taken by a U.S. Air Force ALOTS (Airborne Lightweight Optical Tracking System) camera mounted on a KC-135A aircraft flown at 40,000 ft altitude. Apollo 8 splashed down at 10:15 a.m., Dec. 27, 1968, in the central Pacific approximately 1,000 miles South-Southwest of Hawaii.